Paris of Java, Past and Present | What an Amazing World! Asia, late 19th century. The long-contending British and Dutch colonial forces have by now settled on their respective colonies. The British realm in this part of the world was unrivaled, straddling vast swathes of land from the entire Indian subcontinent (modern-day India, Pakistan, Bangladesh, and Sri Lanka), to Southeast Asia (Myanmar, Malaysia, Singapore, and Brunei), to Australia and New Zealand in the Oceania. Epitomizing its prominence were grand colonial buildings, built to showcase the power and prowess of the British Empire, and to impress the monarchs back in Westminster. Singapore’s Raffles Library and Museum (1849), Kuala Lumpur’s Sultan Abdul Samad Building (1897), and Yangon’s – then Rangoon – Supreme Court (1911) were all commissioned during this period of British administration in the region. The Dutch, on the other hand, with its colonial jewel spanning more than 8,500 km from East to West, were planning to move its capital from the unbearably humid port of Batavia (present-day Jakarta) to the scenic, mountains-surrounded retreat town of Bandung for its year-round temperate climate and fresh air. 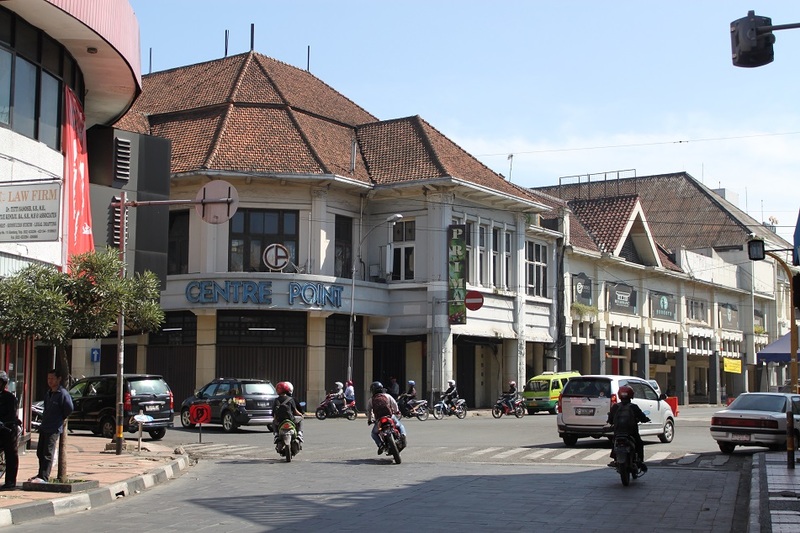 Bandung was also chosen to be one of the places where the soon to be built Grote Postweg (the Great Post Road) would run through – mandated by King Lodewijk Napoleon of Holland to strengthen Dutch colonial establishments in Java to anticipate any possible attacks by the British. The Great Post Road eventually connected the western coastal fishing town of Anyer to Panarukan in the eastern end of Java, almost 1,000 km apart and the first of its kind on the island. It was Willem Daendels – Dutch’s first governor-general in the Netherlands Indies after the state took over the assets of the bankrupt Dutch East India Company (VOC) – who in 1810 visited Karapyak, some 16 km from present-day Bandung, and met its regent, Raden Wiranatakusumah II. 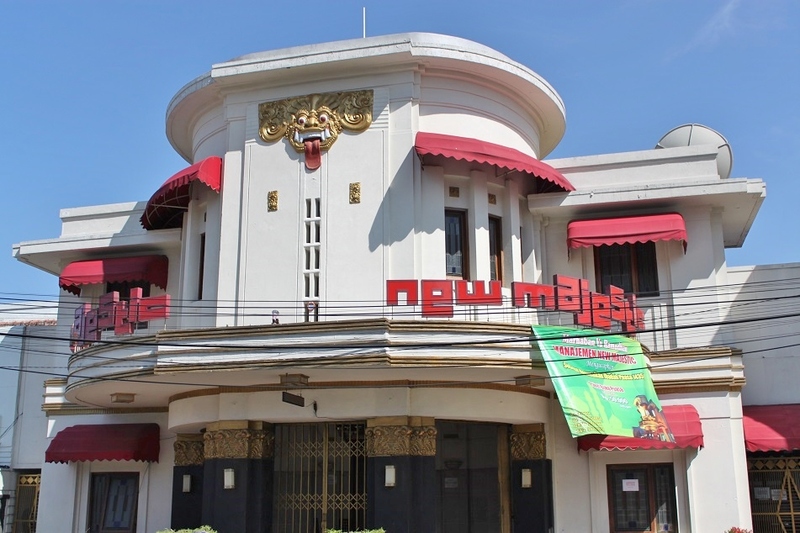 In the decades that followed, Bandung had grown into a major city where beautiful Art Deco buildings sprung up along its main thoroughfares, as well as places far enough from the increasingly busy and pretentious city center. Flowers-filled gardens gentrified the streets and plazas, adding more beauty to the city up to a point where a new moniker was coined: Parijs van Java – Paris of Java. The Concordia Society – an exclusive club boasting membership that of Dutch aristocrats, plantation owners, wealthy businessmen, as well as high-rank officials – occupied a large building at the southern end of Braga Street, arguably the place to go and to be seen during its heyday. 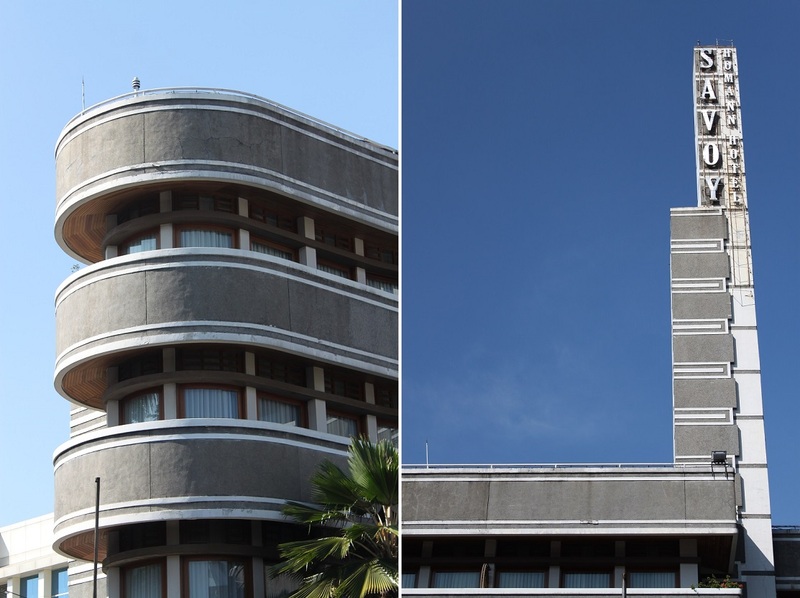 Perpendicular to it was the Grote Postweg itself where the Savoy Homann and the Preanger hotels – owned by a German and a Dutch respectively – together with other Art Deco structures lined Bandung’s most important street. 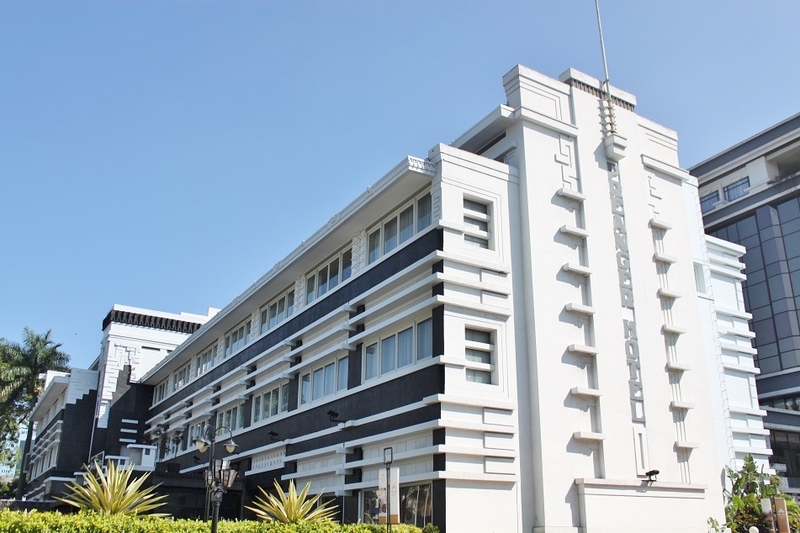 Started as a modest bamboo building, then renovated into a Neo-Gothic structure, the Savoy Homann underwent a final face-lift which gave the hotel its current, Art Deco look. 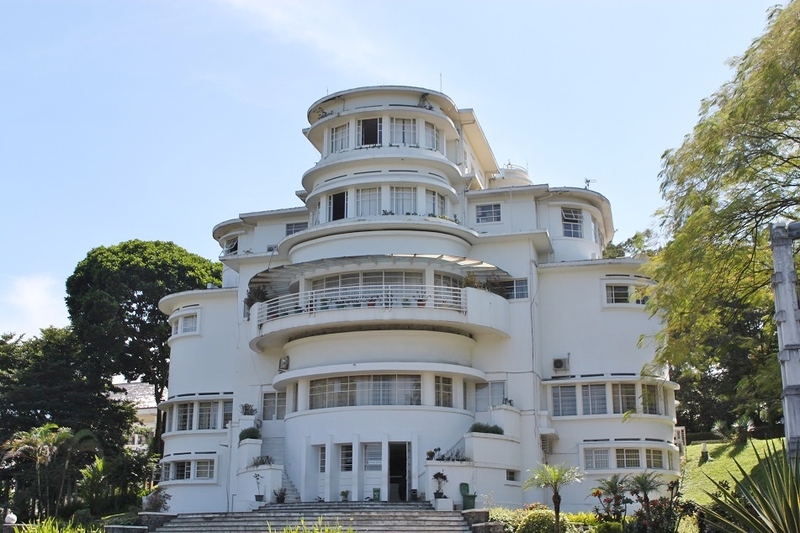 Its heavily-curved façade witnessed guests coming from far-flung places, including Charlie Chaplin and Mary Pickford, to stay in the undoubtedly one of the most prestigious hotels in the entire Dutch East Indies at the time. Meanwhile the Preanger saw a young college student by the name of Sukarno assisting C.P. Wolff Schoemaker’s renovation works to the hotel in 1929. 16 years later the young man became none other than Indonesia’s first ever president, leading a nation of 78 million people. But of all Dutch colonial heritage in the city, none was as grand, impressive, and expansive as the Gouvernement Bedrijven (Government Companies), a huge complex of government offices fronted by a large plaza. Its Moorish, Italian, and Indonesian architectural and decorative elements intertwined on the multi-storeyed building’s exterior, capped by the iconic enlarged ‘skewer’ or sate (satay) in local language. 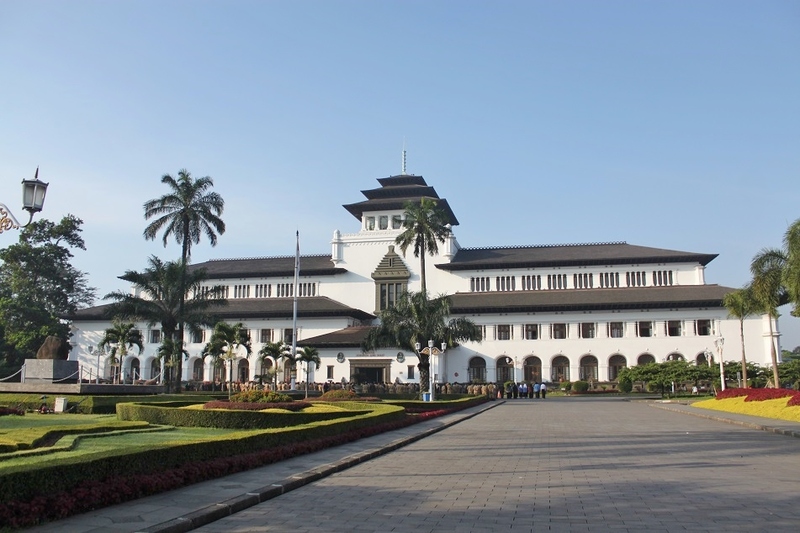 Hence the nickname Gedung Sate (Sate Building). Then there came the World War II, an event which eventually became a catalyst for independence struggle across the region with Indonesia gaining its own in August 1945. In the wake of decolonization spirit sweeping across Asia and Africa post-WWII, the leaders of Indonesia, India, Pakistan, Ceylon, and Burma – all obtained their independence following the end of the WWII – organized a conference uniting leaders from the two continents to reach the same goal: independence from colonialism. The conference – dubbed the Asian-African Conference – took place in 1955 and was held at the same building used by the Concordia Society for their social events decades earlier. 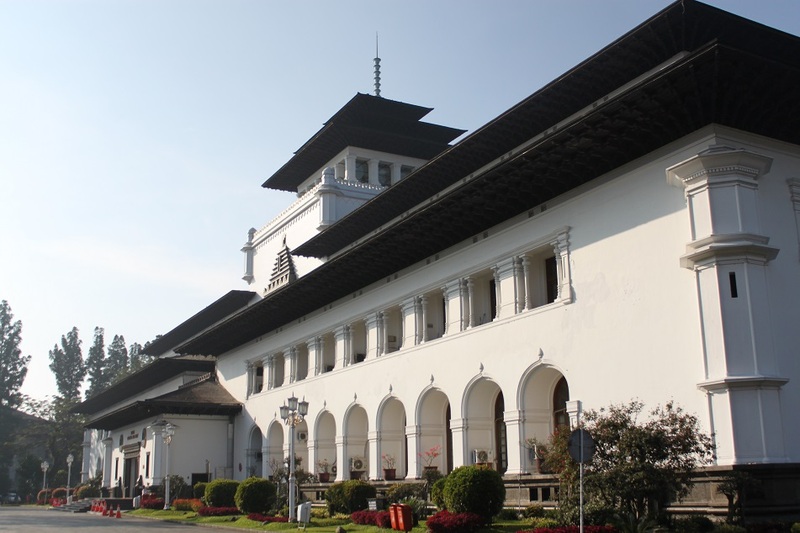 Gedung Merdeka (Independence Building) as it is now called houses a museum showcasing relics and documents from the unprecedented conference which successfully brought together Asian and African independence leaders, from the Kingdom of Afghanistan to Gold Coast (present-day Ghana), from Yugoslavia to the Ethiopian Empire. 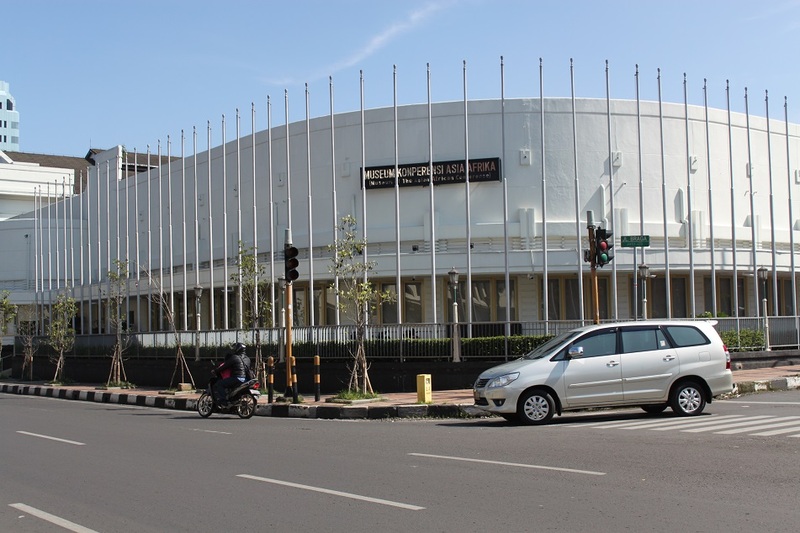 The Savoy Homann, due to its proximity to the main venue of the conference, was chosen as place of stay for the dignitaries, while the Grote Postweg was renamed Jalan Asia Afrika (Asia Africa Street). Today the name Parijs van Java only remains in school books and as a fancy mall in the city offering sumptuous dining experience and upscale fashion boutiques. The city itself has now grown into Indonesia’s third largest, home to more than 2.5 million people thanks to the ease of access to and from Jakarta. Long gone the beautiful gardens, replaced by two things many people come to Bandung for: fashion outlets and unique restaurants. A toll road, completed in 2005, significantly reduced travel time from Jakarta to Bandung by two hours, while the city’s small airport now serves a growing number of domestic and international routes. 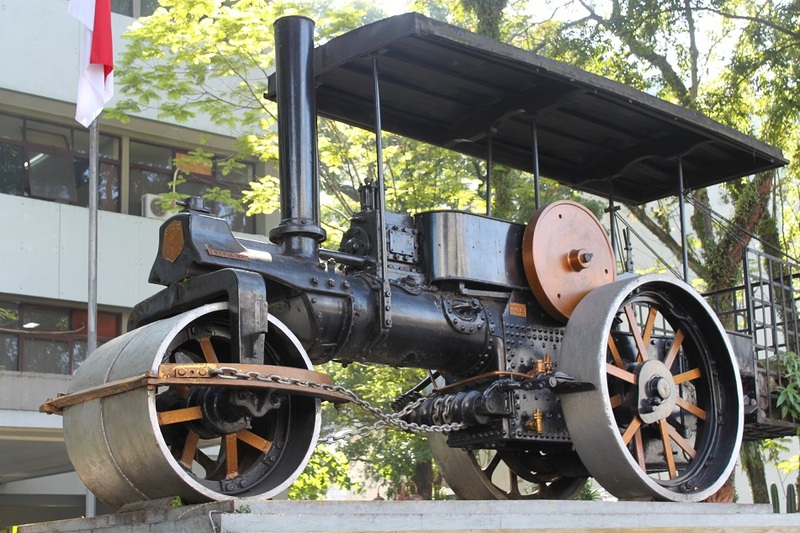 However as the city’s popularity soars, so does its residents’ spirit to revive the city’s colonial heritage and all the charm it has long lost. A new, reformist mayor, Ridwan Kamil – an architect himself – strives to make Bandung a more livable city by improving its public transport, creating decent public parks, and continuously reminding Bandung’s residents to live more healthily through his extensive social media campaigns. It may take a while for the city to rightfully regain its past moniker, but it certainly is moving towards the right direction. 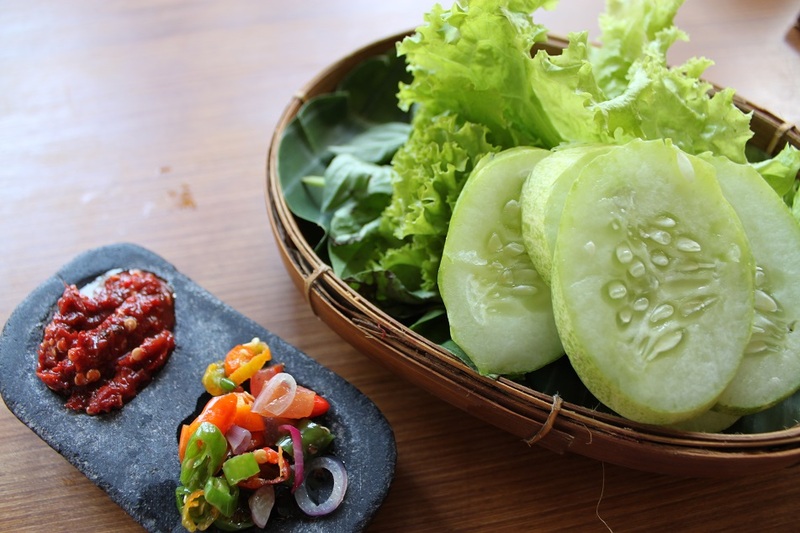 Suddenly I miss Bandung when reading your post..oh, those batagor looks super yummy! Bandung is just a short flight away from Singapore, so you can always return to the city anytime you want. 🙂 Hopefully next time you go you’ll have the time to explore its colonial heritage. Thanks for dropping by! Maybe u can share about distro from bandung. Hi Nandito. I intentionally took distro out of my post because it’s one the things Bandung is famous for — it really doesn’t need any promotion — and this post is more about the history of the city, which many of us are not aware of. Hi Bam, its ok. I think distro the one icon of bandung. According me distro not brand. So, if he/she visiting bandung gonna take one fashion from distro. But this is your blog, u can write anything With all of your journey :). Wih, serem dong bisa hidup? 🙂 Thank you ya, Winny. Hehe, iya ngerti kok. Thanks ya. Thanks, Lee. I spent my college years in the city, but when I visited it a few months ago many things had changed — some things were much better than how I remembered them, but some others got worse, especially the traffic and pollution. But as you said, it’s worth a visit for its history. Batagor and pesmol are my favourites :hehe. Great photos, Bama! You always know how to tell a city’s story in such an amazing way that people who read your post will really really want to go there :hehe. Ah, and there is Villa Isola. M’isolo e vivo. It makes me want to go to Bandung :). Oh iya, Villa Isola itu bisa izin masuk ke dalam atau hanya sebatas lihat dari luar saja? Teriaknya jangan di samping kuping orang ya. 😀 Thank you, Halim. 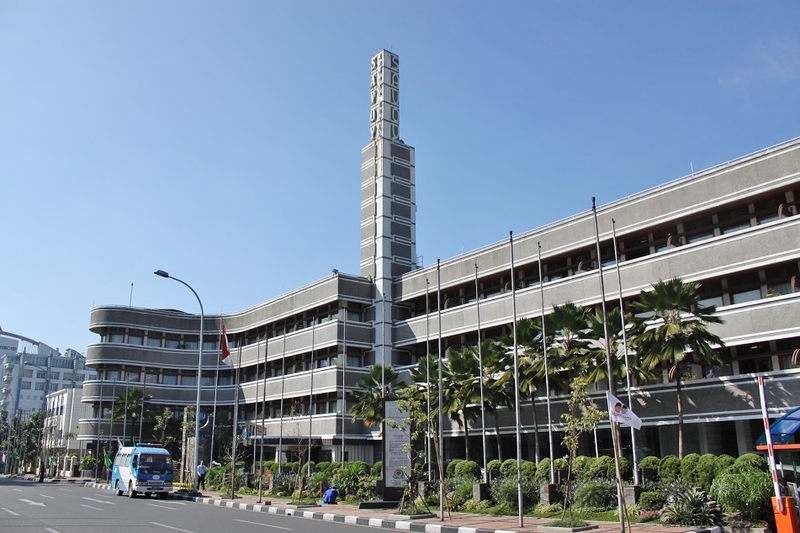 Villa Isola itu sekarang jadi gedung rektoratnya UPI, jadi seharusnya boleh masuk secara terbatas. Thank you, Nina. For this trip I intentionally avoided the weekend — everyone knows how busy and congested the traffic in Bandung can be on weekends. Hey Bama, tud dret? you just break my heart in pieces. I remember all this places so well except Villa Isola (?). I used to walk along Jl. Braga, stopped in the ice cream corner. Is that ice café still there? Or hunting books in Gramedia book shop and sitting in that bakery shop near by. The pictures of the foods make my heart really really aching! too much of the goodies! 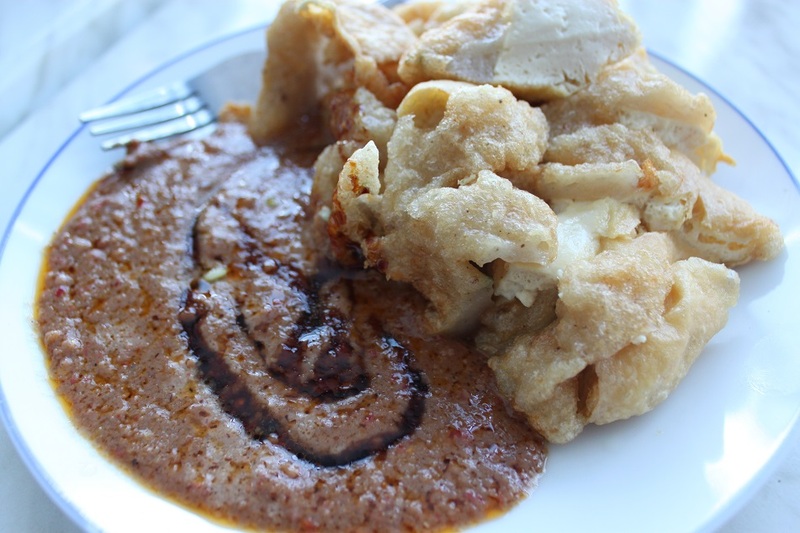 Today i think i gonna make gado gado. hmm yummy. And thankxxxxxxxxxxxxx for posting me and for the old good memories of Bandung. You are simply the best! In fact i was born there. But a lot of things are changing very bad, right? Hi Prem, I’m fine. Hope all is well too! I’m sure if you return to Bandung one day you’ll still recognize some places. But even after more than seven years the city has changed so much — so you can imagine how much it has changed since you left the city. Hmm, I think there are some cafes serving ice cream at Jl. Braga, and maybe one of them is the place you used to drop by. Brigad’ for your kind words, Prem. I’m glad this post brings back really fond and profound memories of yours. Those buildings look totally un-Asian. I feel like those are shots of Miami Beach or something. I was enjoying your post very much until the end and then those photos made me very hungry and I had to stop reading and get some food. Jeff, if you didn’t tell me I wouldn’t have thought that Miami Beach had its fair share of Art Deco buildings — so much more than just a long stretch of beach. Sorry for the food photos 😀 but I’m glad you’re not allergic to peanut and you can tolerate spicy food. Otherwise you would have to take half of Indonesian dishes off the list. Go get your food now! Hi Bama,Ha! 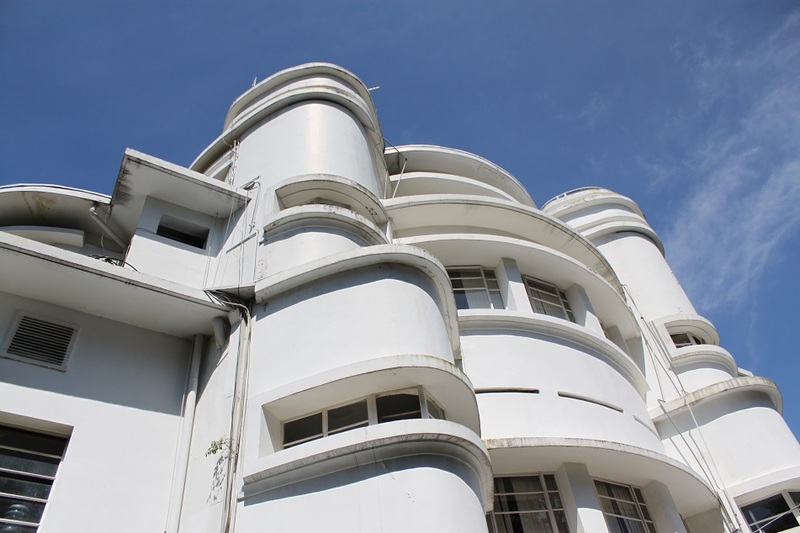 Surprised to see huge collection art deco buildings in Southeast Asia. If I didn’t read your post, I would think those are in Miami’s South Beach. Didn’t know much about Bandung so thank you for the history bits. It’s great that its colonial buildings are well preserved. I’d like to try that Gurame dish. Apparently Miami Beach is really famous for its Art Deco buildings — pardon my ignorance. When I travel to the US one day I will put it on my wishlist, as well as NYC to see you guys! I know you’re not that keen on trying fried dishes, but you might enjoy that Gurame Pesmol — it’s sweet, sour, slightly spicy, and fresh. Thanks for reading, Marisol. Bandung certainly is quite photogenic. 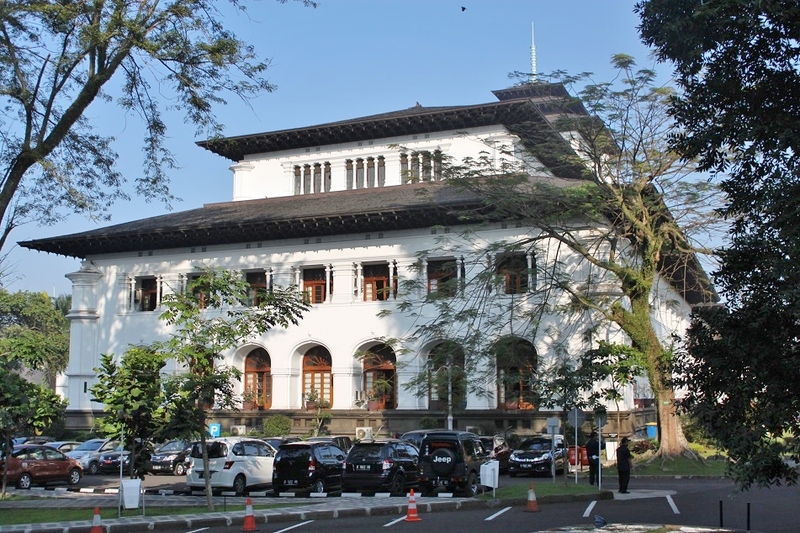 That is such an impressive building…and I am a bit humbled by not really knowing anything of the history of Bandung. Thanks to you, I can now say I know quite a bit more. Impressive post Bama, your ability to capture a place with words and photos is a tremendous gift. I don’t blame you, Randall. Even though it is the third largest city in Indonesia, Bandung is not really known beyond Southeast Asia. The airport only started serving international routes a few years ago — apart from the annual Hajj pilgrimage. Randall, your words just made my day. Thank you for such an encouraging comment, and I can say the same about you. 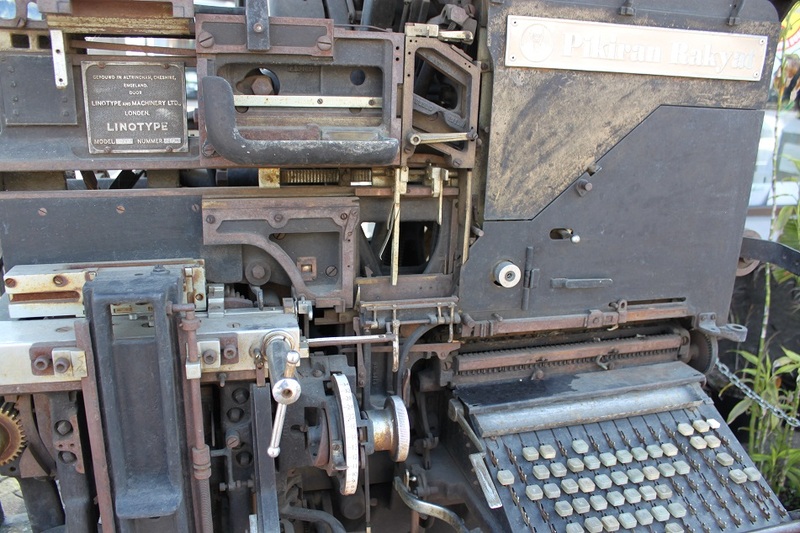 Your posts are some of the most evocative I’ve ever read! I guess I should have titled this post ‘Miami Beach of Java’ instead. 🙂 I have to admit that Florida is never high on my wishlist, but the fact that Miami Beach has a big collection of Art Deco buildings makes me think if I should consider visiting the Sunshine State as well. 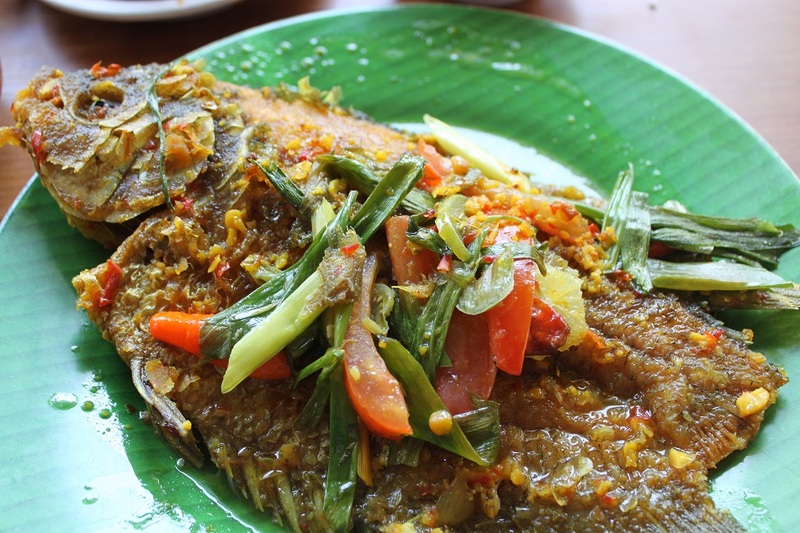 That Giant Gourami was indeed one of the best dishes we had on that one-day trip to Bandung. Thanks Sue! Your historical information is always so enlightening – even though I know basically what happened around the world during the colonial period, I enjoy learning details of different areas. The arrogance of governments and companies of certain countries to just move in and take over is astounding. In Mexico it was primarily the Spanish, and while the colonial cities and churches are quite beautiful, they were all constructed at enormous cost in lives and cultures of the indigenous people. History continues to repeat itself, though perhaps in more subtle ways, through the giant corporations (Monsanto for example) that are pretty much running the show. imho. Thanks for another wonderful post and beautiful photos! Greed is one of the key factors why history keeps repeating itself, and that’s why democracy and transparent governance are crucial in ensuring that it is the people who get the benefits, not only a handful of corrupt officials and businessmen. As for Monsanto, it’s an example how a company would do anything to make as much money as it possibly could — not so much different from the VOC (Dutch East India Company) who exploited Indonesia for its own benefit. It would take quite some time for Monsanto to change this image after all the bad publications. Thank you for such an insightful comment, Marilyn. What a wealth of colonial architecture Bama! I was pretty unaware of its importance too. Thanks for the education and the grand tour. Your photos are as great as always. 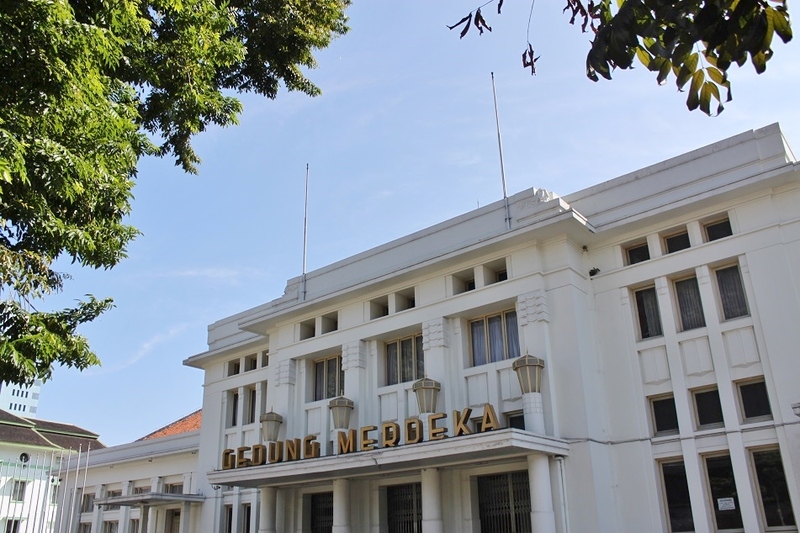 It’s such a relief to know that Bandung’s colonial heritage are quite well-preserved, because many old Dutch buildings in other Indonesian cities were intentionally left crumbling down to make way for ‘modernization’. I think you would enjoy Bandung, as long as you’re in the city not on weekend. Thanks Madhu! Kak Bama, sempat nonton film Lewat Djam Malam, gak? waktu diputer sesudah diretouch kira-kira 2 tahun yang lalu. Settingnya Bandung tahun 1946-an dan itu Villa Isola-nya masih berdiri di tengah padang perkebunan yang luaas banget. Terus Braga masih jadi kawasan gaul yang ngehits banget buat dansa dansi, sampai-sampai adegan belanja di daerah Kosambi pun sudah ada. Mixing of indigenous architecture with modernist movements are the architectural fashion of Dutch colonial homes… Area around Pieterspark and Taman Lalu Lintas have interesting Dutch characteristic that you shouldn’t miss. Ahh thank you for the info on lesser known places in Bandung to look for Dutch colonial buildings. 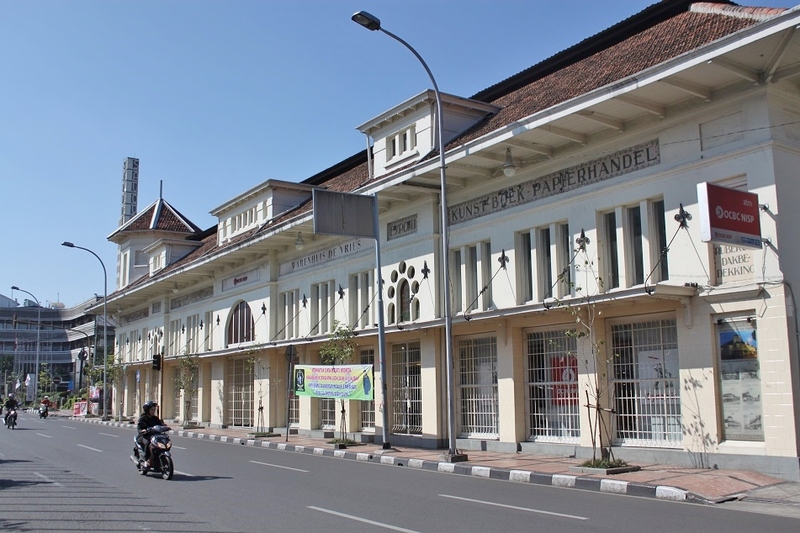 Incorporating vernacular elements into a building’s architecture design was something the Dutch was really good at, especially during the colonial time in Indonesia. Eh urang Bandung oge geuning.. I spent five years living in Bandung, so every now and then I always try to make a day trip to the city just to have those dishes I was familiar with. Reblogged this on Tramaine Loves Travel. 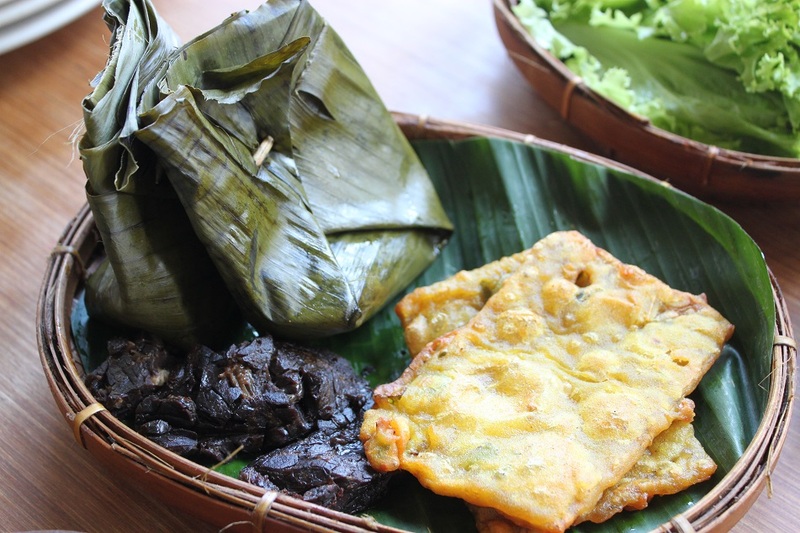 Pingback: Sweet Food from the Heart of Java | What an Amazing World!